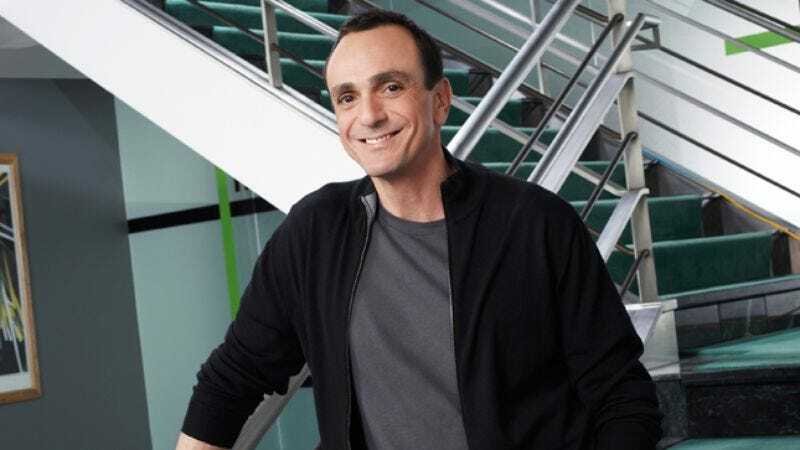 The actor: Although arguably known as much for his voice as he is for his face, after 20-plus years of voicing a variety of characters for The Simpsons, Hank Azaria has never been afraid to step out of the recording studio and in front of the camera. On the big screen, he’s stolen scenes from Robin Williams (The Birdcage) and co-starred with little blue people (The Smurfs) and big green lizards (Godzilla). But he’s also done his fair share of small-screen work, including memorable stints on Friends, Mad About You, and Herman’s Head, not to mention his Emmy-nominated turn as Dr. Craig “Huff” Huffstodt on Showtime’s Huff. The A.V. Club recently talked to Azaria in conjunction with his return to network television: He co-stars with Kathryn Hahn in NBC’s new romantic comedy Free Agents, which will preview on September 14 before settling into its regular timeslot on September 21. Hank Azaria: I would never have remembered that my character’s name was Joe on Family Ties, or… I have already forgotten what you said my name was on Growing Pains. Steve Stevenson? Yeah, great name. [Laughs.] The Family Ties role was the first of many gay roles that I’ve ended up playing. I remember that I made them laugh, and it made me feel good, ’cause it really cracked them up, because… I had one line, basically. Someone asked me about something, and my response was that it was…I said, “Bone-chilling,” but I said it really sarcastically, and they thought it was so funny that they put it on a sound loop, and they’d play it back into the soundstage. I was a huge fan of Family Ties. I think that was my first episodic TV gig, and I was really, really excited to be there. The A.V. Club: What led you to acting in the first place? HA: You know, I was a huge fan of comedy and movies and TV growing up, and I was able to memorize and mimic a lot of things, not realizing that that meant I probably wanted to be an actor. I just really, really amused myself and my friends with memorizing entire George Carlin or Steve Martin albums, or mimicking whatever we saw on Happy Days the night before, or whatever, not realizing that kind of obsessive ability to mimic things meant that I probably had an affinity for acting. It probably wasn’t until I was 16 and did a play at school. I was a rather good student… And then I did a play when I was 16 and completely lost all my concentration for academics. [Laughs.] I didn’t realize it. I just kind of became obsessed with acting, and then by the time I graduated… I did a lot of theater in college, and I knew that not many people make it, but I just figured, “Well, I really want to try acting while I’m young, and I don’t ever want to look back and say that I never gave it a try.” I fully figured I’d be back in grad school—probably for psychology—by, say, the time I was 28. But then I tried it and got jobs like Joe on Family Ties and Steve Stevenson on Growing Pains. [Laughs.] And that gave me enough encouragement to keep going. HA: I think I had a name. [Laughs.] I’m pretty sure I was Agent… somebody. That was actually my first… No, actually, I just started to lie. My first television job that I got after getting an agent in L.A. was… Well, first I have to tell you that I got really lucky. When I was in New York, my girlfriend at the time was doing a lot of commercials, and I walked into her agency—she got me an appointment—and they were not interested at all in working with me, but they were starting a new TV and film department, and a young woman, like, chased me out to the elevator and asked, “Do you want to try going out for… Not for commercials, but for other stuff?” I’m like, “Well, of course!” And she sent me out on something. The very first job I got was an ABC pilot for a series with Peter Boyle called Joe Bash. It was about New York cops, and it was created by Danny Arnold, the guy who did Barney Miller. I got my union card off of that, and that woman I worked with in New York, she worked with a talent agent in L.A. called Harry Gold, who’s kind of a legendary guy. I just ran into him the other day, actually. He still handles a lot of kids and teenagers. It’s kind of his specialty. Tracey Gold is his daughter… Who was on Growing Pains, actually! And he was a young actor himself, I think. I believe he was in Carrie. Anyway, so he says, “Yeah, if you ever come out to L.A., we’ll send you out for pilot season!” So I took my last $700 and came out to L.A., walked into Harry’s office, and said, “Well, I’m here!” And he went, “Great! Who are you?” [Laughs.] I said, “I’m from New York. Remember?” He goes, “Oh. Right. Um… well, listen, we don’t want to work with you unless we’re excited about you, so… can you audition? Do you have a scene you can audition with?” I said, “Uh, no. Well, I mean, I have a monologue.” “No! God, I hate monologues!” I was, like, “Uh, gee, I kinda just thought you were gonna work with me…” So I found a woman in L.A. I happened to know from when I was in New York, and we did a scene together, which I guess didn’t go well, because I found out years later that he sent me out on auditions only because the woman I’d worked with in New York got really furious with him because he said he’d work with me and then didn’t. But then one of the first jobs he sent me out on was Frank Nitti: The Enforcer, and I got it, which I believe was the first real job I ever got in television, apart from one stupid line from Joe Bash. Okay, here’s the thing: I had one line in Joe Bash. I do remember that character’s name: It was Maldonado. They’re doing the roll call, they go, “Maldonado,” and I go, “Here!” That’s my line. And of course it got cut. [Laughs.] I told everyone in the world that I was gonna be on it, and I was cut out, so nobody saw it. HA: Oh, we’re getting more into the modern era. [Laughs.] That was a Showtime series that I did, and… you know, it was a very difficult show to make. As rough and hard to look at as the subject matter was, the doing of that show was equally difficult. It was very logistically challenging. There were a lot of disagreements about what the show should be, and Bob Lowry—who wrote the show, who is brilliant—it was tough to marry our visions all the time, and we both cared so much about it that neither of us were willing to let go. So it was one of those difficult situations where… I think it came out great, but that was the grain of sand, if you will, that created the pearl. And it was also because the subject matter was so rough. It was kind of hard to do that all day long. It’s a lot more fun to do a comedy all day long. But I got to work with my very close friend Oliver Platt, who was one of the reasons I wanted to be an actor. When I went to Tufts, we did a lot of productions together, and he was equally great back then as he is right now. I found his performances back then inspiring. They inspired me to want to keep going as an actor. AVC: They must have continued to inspire you during Huff. You pulled an Emmy nod for Outstanding Lead Actor In A Drama Series. HA: I did. He got two nominations, I got one. And Blythe Danner won two. But who’s keeping score? [Laughs.] Working on that show, I just remember… Especially the first year was the hardest, most emotional job I had, both due to acting the subject matter and agreeing on what we were going to put out there. It was dark. AVC: That being the case, were you disappointed that it didn’t go beyond two seasons? Or had you found your stride by season two? HA: We very much had. I was disappointed that it didn’t keep going. I must say, it was very, very hard work, so I wasn’t totally heartbroken that I didn’t have to show up there for 12 to 14 hours a day and deal with this difficult stuff, but we had definitely found… Well, I found, anyway…a happy, creative place with it after a while. HA: I had a very, very good experience with Bob Greenblatt on Huff, who was the president of Showtime at the time, and his jumping over to NBC was one of the reasons I wanted to do Free Agents. I had kind of sworn off network TV a while ago. I’ve done two or three other network series that did not go well for me. I’m speaking of the non-animated variety. The animated shows have gone very well. [Laughs.] But the two main attractive things about cable shows over network are the shortened schedule—you only do 10 or 13 episodes—and the creative freedom you get, the ability to, for lack of a better term, curse. The challenges are greater, but you can do pretty much whatever you want. But Free Agents… Frankly, it was too good a situation. I tried to say no. I’ve passed over plenty of projects or kept away from circumstances that I didn’t like for whatever reason, but I just found the script and the people to be so delightful that I really thought I’d be an idiot not to jump in. AVC: Did you yourself have a hand in selecting the ensemble? HA: Sort of. A bit. I’m a producer on the show, so I weighed in, and I got a few people to read and come in for auditions. But I get… I dunno, maybe something like a 20 percent vote. I suppose I’d get a veto if I’m like, “Oh God, please, not them!” [Laughs.] I collaborated in that, but it’s certainly not my decision. Now, I will say that, although I agreed to do the show before Kathryn Hahn was on board, once I heard her name mentioned, I did everything I could to make sure she did the show, and I was thrilled when she did. I’d never worked with her before, I just knew her work, but I was even more thrilled when we got together. I knew her a bit personally, so I had a feeling that we’d get on well creatively, and we do. But, y’know, ultimately it’s John Enbom’s show, who I love. He and Todd Holland and Karey Burke are the main producers. Karey, I worked with before on a failed show called Imagine That—she was an NBC executive—and while that show was a difficult experience, she was a bright spot. And Todd Holland, I’ve always loved his work, and John Enbom… I mean, Party Down is one of my favorite shows of the past few years. AVC: Had you seen the original British version of Free Agents before you decided to tackle the American version? HA: I read the script for this first, then I saw the British version. There’s only six episodes, but I really loved them. They’re gems. It’s a little-known, critically acclaimed gem. I mean, much like The Office, you have to Americanize it and make it your own. You have to network-ize it to a certain extent, which we’re still trying to sort out. The British version is more like a cable version, if you will, but I have to think that between myself and John, Todd, Karey, and Bob Greenblatt, we’ll all figure out what will work on network. AVC: At the very least, you’ve got one thread connecting the two versions: Anthony Head. HA: Yes! We loved him so much as the boss in the British version that we had to try and get him for ours, so we were thrilled that he was psyched to reprise the role. AVC: Free Agents wasn’t your first British-series adaptation. You also did the voice of the title character in the animated series Stressed Eric. HA: Oh God. [Laughs.] I actually forgot about that. That was fun. Those were really funny, those British shows. I don’t think they ultimately translated into American sensibility, but it was really tough to basically loop those into “American,” and to sort of idiomatically change the stories enough to Americanize them where needed. It was a lot of work, actually, to do that. AVC: Plus you were more or less doing that at the same time you were doing The Simpsons, right? HA: Yeah, and I remember… I was very busy doing something else while I was doing that, too. Ironically, I think I might’ve been in London doing a play. [Laughs.] Yeah, in fact, I had to sort of take time off from doing the play and record the Stressed Eric episodes. But there were multiple records on that. It took a lot to get that right. HA: [Laughs.] Yeah. I have to say, that poor girl… Well, she ran into my curse of shows. Which I hope is going to be lifted with Free Agents. That was, for a sitcom, one of my rougher experiences. We shot that pilot until, like, 8 in the morning. That’s unheard of on a four-camera show. It was a very, very tough go, that one. AVC: And from what you said a moment ago, it seems like Imagine That wasn’t significantly better for you. HA: It was not quite as bad as that. We didn’t go until 8 in the morning at any point. [Laughs.] But it was close! It was also, uh, not a good marriage. It was a tough experience. My vision of it and the head writer’s vision of it did not match. And that’s always going to be rough. AVC: How was Pacino to work with? HA: Pacino was awesome. Michael Mann does like to shoot a lot of takes—if you’re going to shoot it once, you’re going to shoot it about 25 times—and Al really likes to play around. But I was so young and naïve then that I was silly enough to ask Michael Mann if, when Al was improvising, I could sort of improvise back and start riffing. And Michael Mann thought about it for a minute, then said, “Nah, just say what’s on the page.” I mean, now, of course, as a more experienced actor, I would just not ask. It’s easier to ask forgiveness than permission, you know? I’d just start riffing right back at Al. But I asked Michael and he said no, so I’d be doing the same exact thing on every take while Al was improvising all these brilliant things. It probably frustrated Al, looking back on it. It was probably annoying to him. HA: [In the character’s voice.] That was very fun for me to do. [Laughs.] And also terrifying. It was my first big role in a film, and it was kind of an out-there role to be my first big one. It was really a fluke, the way I got that. It was originally written just to be a one-scene part. That first scene where I’m dressing Nathan Lane, getting him all dressed up? The maid/houseman was supposed to be a whole other character, who was supposed to be a black character like it is in the French version, and… I think he was going to be played by David Alan Grier. And they thought David was brilliant, but they thought that in an American context, the idea of a black houseman would be somewhat distasteful and have racist overtones. So since it’s set in Miami, they decided to make it a Latin character. And I was already playing the other character. So I think it was Robin Williams’ idea: “Why not just combine the two roles and just let Azaria do it?” Which turned into what you could call my big break, I suppose. AVC: To bring it back to improvisation, I’ve read that during the kitchen scene where you’re discussing “the shrimps,” Robin’s sudden slip on the floor wasn’t intentional, but everyone just rolled with it. HA: That was absolutely not intentional. And if you watch that little piece of film again, you’ll see me laughing and Robin laughing. It’s one of those things that happens that you never really think they’re going to use, but I was so emotionally upset in the scene—I was supposed to be crying—that I just pretended that he was making me cry even more. But I was actually laughing. AVC: Beyond that scene, though, how much improvisation were you permitted on the film, given that it was based on some pretty well-known source material? HA: You know, that question is very interesting in context to that movie, because as you know, Robin is a pretty notorious improviser. And so, to a lesser-known extent, is Nathan Lane. He’s a tremendous improviser and a witty, witty off-the-cuff guy. So they both really wanted to go to town improvising in the film. And Mike [Nichols] said, “Listen, we’re going to rehearse this for a solid two weeks, and we’re going to rehearse it really hard before we start shooting. We’re going to rehearse it like the play, so that by the time we’re ready to shoot, you could almost perform this as a play yourselves. And Elaine…” Elaine May, you know, adapted the script. “Elaine and I are going to be sitting there, so pitch all your ad-libs and try everything you want to try in rehearsal, and we’re going to write down what we think is the best of all the ad-libbing, and we’re going to put it in the script. But then I want you to stick to what we have, because I don’t want to have to cut a lot. I want everything to play as continuous actions, so I don’t want to stop and try 19 different alternate lines or different versions.” And that’s essentially what we did. We sort of got all the improvising out of our systems the first two weeks, and then we shot basically what we all agreed on. And it was very tough for Robin, who really wanted to still go bananas. [Laughs.] And he still would once in a while, when Mike was amenable. When the shot allowed, he would do what we’d call the “wild takes,” just for Robin to go crazy. And much of that did make it into the movie. But I pretty much stuck to what I had worked out in rehearsal. AVC: It’s always seemed like working with Mike Nichols on The Birdcage had at least a little to do with you being cast as Sir Lancelot in Spamalot. HA: I think that’s right. I think Mike thought of me and figured I should do it. I knew Eric [Idle] a tiny little bit—he plays a character on The Simpsons called Declan Desmond—but, yeah, I think it was probably Mike’s idea. HA: Matthew Perry was the first friend I made in Hollywood. We met when he was 17 and I was 22. We booked our first pilot together: a show called Morning Maggie, with Ellen Greene, that never saw the light of day. So I was very happy to be working with him in the middle of his huge success. That was as fun a set to be on as you might imagine, but especially back in that first year, where it was literally like being in the middle of Beatlemania. It was really fun to be in the middle of that and enjoy it while it was the phenomenon that it was. Herman’s Head had just gotten cancelled when Friends was first starting up, and when I read that script, I was like, “Oh my God…” At the time, when it was a pilot, it was called Friends Like Us, and just about everybody who read it knew it was going to be special. I mean, they didn’t know it was going to be as huge as it would become, but they knew it was a really funny script that they wanted to be in. And I went and auditioned for Joey and got rejected, but—and this was the first and only time I’ve done this—I asked to go back in. I said, “I know you said ‘no’ to me once, but I just want to try it again, because I like that show that much.” And I went back in… And I got another very quick “no.” [Laughs.] Almost as quick as the first time. And you know, it’s tough coming off a series that’s just gotten cancelled to be hired right back on another series, especially when they had their choice of every actor in town. But then I did the movie Quiz Show, which came out around that time, and I think my stock went up a bit. And as a result, they offered me the role of David, which is one of those examples of how in Hollywood, you’re only as good as your last thing. When you’re on a series that’s been cancelled, there’s a little bit of a stink on you. When you do well in a movie that’s seen as really great, you’re revitalized for six weeks. AVC: You got to reprise the role of David late in the series’ run. Had they been trying to arrange that for a while, but just hadn’t been able to schedule it until then? HA: Yeah, they had always said that they wanted to bring me back, and I’m like, “Please, any time,” and I was always busy, or they had gone elsewhere with the story. And by the end, it was… It was really like a soap opera. Paul Rudd and I really didn’t know which of our characters would end up with Phoebe. And I was kind of disappointed when Paul won out, actually. We really didn’t know how it was going to go. I was sort of contracted for a bunch of episodes, and didn’t know whether… I think the plan always was that my character would ride off with Phoebe into the sunset, but then Paul proved to be so charming and funny that he won out. HA: That was quite a quirky little film. I was disappointed with how it fared, but it was fun to work on. And boy, there’s an opposite example of… not purely improvised—we absolutely stuck to the script—but for that character, I felt very strongly about him never saying the same thing twice, always trying different things, and really going out there with just changing things up all the time. I think I drove the director [Kasia Adamik] a little insane, I did it so much. [Laughs.] But I just felt like that’s what that character needed. I just kind of really went out there with that. It was great to work with Lisa Kudrow again on that, too. For a while, most of my career was spent kissing Lisa Kudrow. I was on a big streak there. AVC: There are worse fates. HA: Way worse fates. [Laughs.] I enjoyed making that movie. It was fun. It was a… I’m not going to say it was fearless, but it was a major leap of faith. I just really committed to trying to never repeat myself. I’d seen actors do that on films, and I was, like, “I wanna try that once!” Ultimately, I’m much more in the school of getting one or two versions that feel right, as opposed to going all over the map. But it’s fun to exercise that once in awhile. HA: [In the character’s voice.] “Master of silverware. Forks a speciality.” That movie… I look at it now very, very fondly. I actually just saw a little bit of it a couple of weeks ago and enjoyed it. It was one of those that was very, very difficult to make and should’ve been much more fun than it was. It was logistically a very hard movie to shoot, with all the effects, and it was kind of the early days of CGI things, and people didn’t know so well how to marry that kind of technical filmmaking with comedy. It was tough. It was really like trying to be funny in the middle of a math equation or something. And as a result, it made things… Very long hours, very stressful and tough on the set. I think we all felt—“we” being the actors: me and Ben, Bill [Macy], Janeane [Garofalo], and others—very out there, if you will. It was kind of a big swing, or a high-wire act, and it would’ve been hard enough just to do a little comedy with that subject matter, but given that it was a big, expensive CGI festival, it was highly pressurized. It was tough to all agree, between the producer, the director, and Ben, Bill, and myself, especially, and then all the others actors, too. I mean, when you’ve got that many comic minds—Janeane, Paul Reubens—not to mention Geoffrey Rush and Lena Olin, it was tough for everybody to agree on the vision. And it was a first-time director, a guy named Kinka Usher, who was a brilliant visual guy and does a lot of commercials, but was not an old salt, and he had to be a daddy on the set to a bunch of ego-y actors running around, wanting their funniest bits in. So it was… There were some hilarious moments where, y’know, there we are, dressed as these ridiculous superhero characters, having very heated arguments about what we should be doing or saying, and we’d take two steps back and go, “What are we doing? I have a turban on, I’m throwing a fork, and I’m yelling about what I think would be the funnier way to throw it at somebody.” It was just ridiculous. But it was a long, technical, difficult shoot, and I think it could’ve come out better if we’d all found a way to have more fun with it. AVC: Do you have any theory as to why Kinka Usher has never directed another film? HA: That was the very first film I ever did. I mean, Pretty Woman was the first film I had any lines in, and Quiz Show was the first kind of big film I did, but Cool Blue… I can’t remember which came first, Pretty Woman or Cool Blue. But it was certainly the first big part I had in a film. I learned a lot. I became good friends with Woody Harrelson, and Richard Shepard and Mark Mullin and I got really close, the guys who wrote and directed that. I made a lot of friends doing that, and I was absolutely terrified. I had no idea what I was doing. I remember one night, we hung out with Sean Penn, which to me was like… I mean, I still hold him in the status of, like, Marlon Brando or whoever, but to be 23 years old and grow up pretty much idolizing Sean Penn, and then to get to hang out with him one night? I think I remember that more than anything we did while actually shooting the movie. [Laughs.] He was as cool as you would imagine he’d be. God, you know, I haven’t thought about that movie in a long time, and… I can tell you this story, which I’ve told a bunch of other places, but I kind of cut my teeth on that movie. As an actor, I look back and see a lot of mistakes and bad acting that I do here and there, but one time I was watching TV late—this was about 15 years ago—and it came on in the middle of the night. My girlfriend’s asleep on my shoulder, and I’m watching it, and I’m kind of glad she’s asleep, because I kind of wanted to check it out, ’cause I didn’t feel like I was very good in it. And I’m watching it, and I’m, like, “You know, this isn’t as bad as I thought. I mean, I’m doing okay.” Sure, I found some moments that, if I could do ’em over again, I would. This is on a regular channel, with commercials and everything, and they even had an announcer. And he said [Announcer voice.] “We now return you to Cool Blue, starring Woody Harrelson… and Hand Azaria.” Pronounced my name “Hand.” I couldn’t believe it. I woke my girlfriend up, I’m like, “Did you hear that? I just got called ‘Hand Azaria’!” How do you make that mistake? He must be reading it off a card, but what, he’s like, “Well, this is either ‘Hank’ or Hand,’ and what with ‘Hand’ being the more common name…” [Laughs.] I have no idea how he made that mistake. But some of my friends to this day will refer to me as Hand Azaria. HA: Working with Jack Lemmon was a tremendous learning experience. I asked him a lot about acting. It was actually very moving when I realized halfway through shooting that… Jack actually was quite ill when he shot that, so I think that’s why the material spoke to him so much. But having just talked about Cool Blue, this reminds me of another billing problem I had. I get called “Frank” a lot. For some reason, people want me to be named “Frank.” I don’t know why. I think it’s because my last name sounds Italian even though it isn’t—and “Frank” sounds like it goes with Italian last names. There are a lot of Italian “Franks,” I think. So I get called “Frank Azaria” a lot. I’m just used to that. [Tuesdays With Morrie] was a TV movie, y’know, for ABC, and it hadn’t come out yet, but I’m in New York, I’m walking down Broadway, and there’s this big ABC-Disney store there. They have these big posters in that window of upcoming ABC projects, and there’s this big poster of me and Jack Lemmon. And I’m like, “Okay, that’s pretty cool: me and Jack Lemmon on a poster.” And in giant yellow letters on top, it says, “Jack Lemmon and Frank Azaria.” Right on the poster. I mean, you’d think that a guy doing typesetting for a network thing would get that right. I just stared at it for about five minutes, then I called my agent and said, “Uh, Houston, we have a problem.” And I made sure that the entire campaign didn’t feature my name as “Frank Azaria” everywhere. AVC: Mitch Albom was pretty hands-on with the adaptation of Tuesdays With Morrie from book to television, wasn’t he? HA: Oh, yeah. I met him and I knew who he was, ’cause I’m a big sports fan, so I had watched him on Sports Reporters and stuff. But yes, Mitch has become a very close friend of mine over the years, and I got to know him very well because of that. In fact, his book Have A Little Faith, they’re just shooting that with Laurence Fishburne and Martin Landau, and they wanted me to play Mitch again, and it really broke my heart that I couldn’t. I really wanted to, but I couldn’t make it work with my Free Agents schedule. So Brad Whitford is going to be playing Mitch in this one. There are things I turn down just because I don’t want to do them, but this was one that I was bummed that I couldn’t do. Plus, they, uh, offered me a lot of money. [Laughs.] So I was really bummed that I couldn’t do it. AVC: Speaking of being offered a lot of money, it’s easy to ask, “Why would you do movies like The Smurfs and the Night At The Museum sequel?” But they’re probably fun, and there’s definitely a decent paycheck involved. HA: You are exactly dead-on. [Laughs.] I would be lying through my teeth if I said they didn’t have to pay me to do those movies. They are very nice paychecks, and that is probably the main reason. That said, honestly, I won’t even do that unless I think it will at least be fun to do, and hopefully that’s the way it will turn out. But you can’t always control that. Honestly, anything I do, whether it’s for the money or any other reason, I really try to throw myself into it, figure out the funniest, cleverest way to get the material over, and make it fun to do and fun to watch. And those movies, they’re for kids. That’s another thing you tell yourself as you count the money: “Eh, it’s for the kids.” [Laughs.] But it is a little bit of a different standard. You are aware that you’re mostly trying to make 10-year-olds laugh. That said, I’m always trying to find a way—and it is a challenge, but it’s a fun one—to make a 7-year-old and a 37-year-old laugh at the same time. How can I do that? AVC: With the Night At The Museum film, you had a script from the guys behind Reno 911! [Robert Ben Garant and Thomas Lennon] to work with, which is not such a bad pedigree. HA: Exactly. Certainly on Night At The Museum, you had some very intense comedy people involved, including the cast. There were no slouches anywhere you looked there. Granted, we’re making a movie for the kiddies. Not to mention that the first one made a gajillion dollars. It’s hard to ignore something like that. AVC: With The Smurfs, though, a lot of the comedic talent—though certainly not all—was in the recording studio rather than on the set with you. HA: That’s true. I mean, you might get an argument from Neil Patrick Harris, but… [Laughs.] Hey, listen, that was… well, you know what that is. It’s a big paycheck, it’s a kids’ movie, it’s something you feel like, if it works out, it could turn into sequels and can be even be, uh, even more money. [Laughs.] But that said, I approached it like I would anything: How can I be as funny and creative and clever about this as I can? And, you know, I tried, and I was pretty happy with how I came out of it. I was amused by Gargamel, and enjoyed it. I got to do a lot of the weirder things that I asked to do. AVC: Is it harder to be funny when you’re wearing that much makeup? HA: Yes and no. You’re sort of already visually funny without trying, but working makeup like that is almost like working a mask. You have to really know how to work your expressions. I don’t usually like to look at playbacks, because it makes me self-conscious, but I did it a lot on that film, because I’d know I’d get a take right vocally, and I’d feel that the timing was good, but then I’d look at it and I’d be like, “You know, I didn’t really sell the facial expression enough.” Because behind the mask and the eyebrows and everything, it didn’t read. So I had to learn to work it like a puppeteer, in a weird way. HA: [In character’s voice.] Yeah, Nat’s a guy who talks like this, based on a guy I grew up with who talks like this, who I recently ran into the other day, and… He doesn’t realize this is him. But I ran into him, and he said, “Hey, I saw you on Mad About You, and I really like that character.” I didn’t have the guts to say, “Yeah? It’s based on you!” [Laughs.] I was with Helen at the time, and… Actually, I didn’t meet her doing that, but she was so busy doing that show all the time that I was around the set all the time, so I was like, “Well, why not put me to work?” And I always joked around with that character, so they said, “Hey, here’s a funny character who might fit well!” I had fun doing that. It was fun to be able to see my wife every once in awhile. My wife at the time, that is. HA: Brett Morgen called me up and said, “We’re doing this weird thing where I want to animate excerpts from the Chicago 10 court transcriptions, and I want to get it as vocally approximate to these guys as I can.” And I was very intrigued and challenged by that. I spent a long time listening to Abbie Hoffman and Ginsberg. That was one of those where… With certain accents that I do, I have a pretty good ear and can mimic things maybe 75 percent just on first hearing it, but to get something really exact—like, to do an authentic French accent—to take it from, “Oh, that’s a good French accent off the top of your head” to “That sounds authentic,” it takes a few weeks to really get in there. And that’s what it was like trying to do an authentic Abbie Hoffman. I mean, you have a lot of Abbie’s real voice in the movie, so I wanted to as closely as possible sound like it was him talking. So that was really challenging and fun to do. It was a really cool voiceover gig. AVC: That was your first full-time live-action sitcom gig, right? HA: Yes, and I was very excited to get that when I got it. It was… fun. It was one of Witt-Thomas’ last real big shows. [Paul Junger Witt and Tony Thomas] had an amazing run of really funny sitcoms in the ’70s and ’80s—Soap, The Golden Girls, Empty Nest, blah blah blah—and I was really psyched. I learned a lot. You know, there’s nothing that replaces when, every week, you have to get out there and make shtick work, basically. I never really stayed with the stand-up thing. I think a lot of comedians find those kinds of chops out on the road and spend years doing stand-up and working audiences. The Simpsons meant a lot for me as far as learning to create characters, but there’s no audience when we record The Simpsons, so it’s a different thing. So to just get out there and make jokes work week after week after week… That’s what I remember most about that show. Especially the times when the jokes were, y’know, maybe not that great, and you really have to make a purse out of a sow’s ear, if you will. That becomes a skill that’s even more valuable than making good material work, in some ways. For a comedian, anyway. Like they say, there’s no unfunny material, only unfunny actors, which isn’t quite true. [Laughs.] I made really good friends doing that, but the truth is… I didn’t really love that show. AVC: You said as much on one Simpsons commentary. HA: [Laughs.] So there you go. And the people who still come up to me and say, “Oh, Herman’s Head, I used to love that show,” it’s… It’s always an awkward moment when people come up to you and they like something you did that you don’t like, ’cause you kind of want to go, “Well, then, you must be kind of an idiot.” [Laughs.] But you don’t say that, of course. You say, “I’m glad you enjoyed it.” But I was sort of happy when that show ended. I was kind of tired of doing that. AVC: Did it make for an interesting dynamic to work with Yeardley Smith both onstage during Herman’s Head and in the recording studio for The Simpsons? HA: See, there was a time when, my God, we saw each other… I mean, we’re still really good friends, but there was a time when, boy, we saw each other all day long. And I do mean all day long. AVC: I’ve read that the only voice-acting credit you had prior to The Simpsons was as the title character to a Fox pilot called Hollywood Dog. HA: That is true. That is 100 percent true. In fact, it directly led to The Simpsons, because Hollywood Dog was this failed pilot that was sort of in the vein of Who Framed Roger Rabbit. A very cheap version of Roger Rabbit, where the dog is animated and everyone else is real. Again, in the very early days where no one had the slightest clue how to work anything like that. But I did the voice of the dog. It was a Fox show, and this was in the early days of Fox, so for it to be a pilot that they didn’t pick up, you can imagine how bad it was. [Laughs.] And I think the casting director, Bonnie Pietla, knew of me, or probably the Fox casting person knew of me because of this Hollywood Dog thing that I did, so they had me in to read for The Simpsons. HA: It was one of those things where I walked into a little room, and I hadn’t read a script. They just handed me sides and said, “This guy’s a bartender. What would be a voice you’d do for him?” And at the time, I was doing a play in Hollywood where I was playing a drug dealer, and I was doing sort of a bad Al Pacino impression from Dog Day Afternoon. [Begins impression.] Kind of talking like this, you know. “What’s happening? I’m dyin’ here! Everybody’s comin’ down on me!” So I did that voice, and they’re, like, “That voice is interesting, but we want it to be gravelly, though. Like, raspy.” So I said… [Moe voice.] “Well, I can make it sound raspy.” And that was Moe. And then… Literally, that was for Matt Groening and Sam Simon, and they just said, “Okay, cool, man,” and they had me walk over and just record it. It wasn’t even, like, “Okay, you have the job,” or that there was a callback or anything. It was, “Great, good, c’mere…” And I walked over to the recording booth and recorded it, and that was it. AVC: It seems to be a recurring theme for your voices to have been directly inspired by other voices, like Chief Wiggum and Edward G. Robinson, Professor Frink and Jerry Lewis, and so forth. Is that a direction they give you? HA: No, that’s just where I go. I found early on that some impressions are fun to do exactly, and some, even if they’re bad impressions, end up being interesting character voices. Certainly, at least, for a cartoon. [Agador Spartacus voice.] This voice, from The Birdcage, it’s kind of the way my grandmother talks, you know? [Laughs.] That’s a good character, and a feminine one, that worked really well for that. Vocally, if I can find a voice for a character, I’ve found a lot of their character, if you know what I mean. I think more voice actors should use this technique. I mean, Woody Allen talks about how, especially in his early career, he felt like he was just doing a direct Bob Hope impression. And if you look at his stuff, he creates that kind of humorous coward, that jokey coward character. It’s pure Bob Hope. But it’s coming out of the filter of Woody Allen, which is completely unique, so it doesn’t seem like Bob Hope. But in his brain, it’s Bob Hope. AVC: After so many years, do you find it hard to find new voices for new characters? HA: You know, honestly, yes. It took a very long time. I say with pride that I’ve done over a hundred voices or something, and some of them may have only had two or three lines, but I literally never ran out. I think I’m a bit of a savant that way. I kind of remember every voice I hear, famous or otherwise, and can imitate it pretty fast. I’ve enjoyed mimicking people famous and not famous all through my life, and they kind of remain in the memory banks, so I’m ready to trot them out. But it hit a point a few years ago… I mean, I made it to, like, 15 years of doing The Simpsons before I felt I was kind of tapped out. Sometimes I do variations of voices I’ve already done, but when I do that, then I start thinking about whether it sounds similar to this other guy, and I’ll be, like, “Yeah, it sort of does.” I mean, there’s still a lot to choose from, though. Some of these voices were just one-off characters. In fact, the voice I use for Gargamel is one I did on a Simpsons episode something like 20 years ago. He only had, like, four lines, but I did it. Or, at least, a variation of it. AVC: What was the character? HA: [Launches into the voice.] It was the character who sold Homer the monkey’s paw [in “Treehouse Of Horror II”]. Gargamel is a little more gravelly, but it is essentially the same voice. AVC: Has it ever surprised you when a particular character of yours made the jump to having semi-regular appearances on the show? HA: Uh, yeah, you know, almost all of them. [Laughs.] I mean, really, they all kind of started as throwaways. Moe, Apu, Wiggum, certainly Comic Book Guy and Frink, all of them started as sort of weird incidental characters, just kind of four-line asides. Superintendent Chalmers, Bumblebee Man, Carl: They were all just, like, weird filler characters. But after a while, you need to expand out, and you need ideas for stories. I really love that about a lot of these characters: Most of them were not meant to be fixtures. AVC: Now, are you the voice of Crazy Old Man, or is that Dan Castellaneta? HA: That’s Dan. I’m Old Jewish Man. HA: That’s all right. How can you possibly keep track? [Laughs, then does the Old Jewish Man voice.] I can, ’cause he sounds like my other grandma. AVC: So when they told you there was finally going to be a Simpsons movie, did you, like the rest of us, still say, “Yeah, sure, riiiiiiight”? HA: Yes, of course. [Laughs.] But that was already contracted. That was folded into our TV deals, or maybe there was a separate movie deal at some point. But it eventually all became part of the same deal. And I’ll do another one, too. You’ll see. Try and stop me! AVC: When should we expect that? 2025? HA: Who knows when they’re going to do it again? But they’ll do it again. For sure. The first one made too much money for them not to. AVC: As far as the series goes, this is probably more of a question for Matt Groening or executive producer Al Jean, but have you yourself heard anything about an eventual end date yet? HA: Nah. I mean, I’ve heard whisperings that the end may be in sight, meaning within a few years. But who really knows? But it’s certainly not going to be this year or the next.